In this article we can explore OData examples for string method startswith. This filter returns the field values starting with specified string. Please note that the method-name is case sensitive & only lower case works. Please create the data as shown below. Following is the query URL. Following is the result using Chrome browser. Please note that we are querying against column named Title. Now let us try with an non-existing string. Following is the result using Chrome browser which shows no-results. You can now play with more examples. Please note that the operation name should be in lower-case. In this article we have explored OData with method startswith. In this post we can explore the String Comparison Filters of OData using SharePoint 2013 REST API. Following are the String Comparison Filters in OData. This filter returns the field values containing specified string. Please note that this is case sensitive & only lower case works. This filter returns the values whose length is greater than specified number. This is an operational method and replaces the string with given value. To convert field values to lower case. To convert field values to upper case. OData stands for Open Data Protocol. OData allows Filtering & Interoperability on REST services. We combine OData along with REST methods. So REST + OData allows gives more flexibility in querying & filtering items. In this post we have explored String Comparison filters of OData. In the upcoming posts we can test each of them against list items. In this article we can explore OData using Numeric Comparison filters. To proceed with the example I encourage you to create a Contacts list with a column named Age of type integer. Please fill some data appropriately. Following is the example of using Equal filter where the column Age is equal to 30. The result was one list item as per my data. Please note that uppercase (EQ) won’t work. Following is the example of using Not Equal filter where the column Age is not equal to 30. Obviously it returned a lot of items. Following is the example of using Less Than filter. As there are no items with Age less than 10, my result was empty. Similarly you can play with the remaining Arithmetic operators. In this article we have explored Numeric Comparison filters of OData on SharePoint 2013 REST services. In this post we can get introduced to OData along with REST. REST stands for Representational State Transfer. It is a stateless communication protocol using HTTP and ensuring HTTP verbs are accurately used for CRUD operations. Please see references for more information. But, REST have drawbacks on querying and filtering. For example, using the URL format it is difficult to filter items. Following OData sample specifies selection of Title column only. FYI: The above query without the Title selection is as following. Although REST is stateless like HTTP, the sessions are stored in client-side and transferred back and forth from web server. In this post we have explored usage of REST with OData in SharePoint 2013. In the upcoming posts we can explore more options in OData. 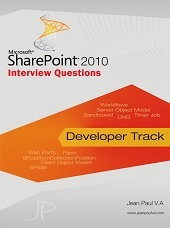 What is the scope of SharePoint Developer going ahead? Will SharePoint Online takes away SharePoint Administrator jobs? What is the market range for SharePoint professionals? I would like to answer these queries based on my research & to the broader audience. I cannot clearly see a trend-reversal in SharePoint Developer demands. I agree that, Moving to SharePoint Online could have reduced lot Administrative works, But still there are Power User & Developer need. This also means, the Server Object Model style is slowly dying. So if you are serious with your Server Object Model skills & C#, I would recommend you to move towards PHA or App-Development/CSOM. The current market in 2015 shows that, there are not enough Skilled SharePoint developers, especially in the Hot Skills above. If you are a SharePoint-PHA developer with good practice on PHA server configuration, app deployment, I am telling you – You could demand the highest-salary in the SharePoint segment. So SharePoint Developer market is short of supplies. As I said, although SharePoint Online is taking away lot of Administrator jobs, the migration is slower. There are lof of customers still using SharePoint 2010. So the Administrator job should be safe for next few years too. Not all customers can go Online. Friction of data-security stops them from going Online. SharePoint Online frees up some areas of work like Server Configuration, Farm Configuration, Scaling, Database Tuning etc. SharePoint Online still requires Administration & Power User activities. There is PowerShell version for SharePoint Online too. Social Computing, Office Graphs are forecasted high-growth arenas. Hybrid environment is gaining speed which provides the right advantage-mix of SharePoint On-Premise and Online versions. Good to have this. For Administrators, I would recommend the bullet points of SharePoint Online, Yammer/Social Collaboration, Exchange Online, Lync Online, SharePoint Online Management Shell in their Resume. How much you can get in USA? Now, let us talk about the Money! Of course, money is a key-factor in career. My research says that, following are the hottest SharePoint required areas in US. The pay rate goes like below for a 10 year experienced developer, with at least 5 year SharePoint experience. How much you can get in India? My friends over India says about the following market rates. The good news is that SharePoint is still growing, whether On-Premise or Online versions. Also, There are lot of migrations happening from Non-SharePoint systems to SharePoint. The Migration tool sellers also enjoying the show. If any of my research data changes, I can update you through the blog subscription. You are encouraged to subscribe through email. In this article we can explore more REST and examples. We can get List information using the Title of the list. Make sure you have a list named Contacts. Please note that REST API is provided using the context _api. Using chrome browser I received the following output. Although IE 11 hesitated to show the output, giving an error message. But in IE too, we can view the output using View Source option. By default XML format result is provided by SharePoint REST services. In programmatic way, we can format these results to JSON format. We can try getting the list items using REST. Using chrome browser I was able to view the following results. However In IE the result summary was shown. Please note that REST is trending as a replacement for JSOM in SharePoint world. REST provides much easier, less-coded ways of working with client-side object model. In this article we have explored few REST examples using browser URL box. In this article we can see how to enable Like on List items. Like is a Micro blogging feature of SharePoint 2013. Although it is disabled for list items by default, we can enable it through list settings. To start with, create a new list & add few items into it as shown below. Now go to the list settings. You will see the Rating settings as shown below. Choose the following options there. Save changes and come back to the list. You should see the Like link now. You can click on the Like link to test it. Now the Like link converts to unlike while also displaying the Total Like count. This demonstrates the usage of Rating Settings to enable like item for a list item. We can use the Like functionality to enable user-voting on multiple choices. In this article we have seen how to enable Like button for list items. In this article we can have a start with REST API. SharePoint 2013 introduced REST API which allows alternative & easier usage than CSOM/JSOM. The simplicity of REST is that we can use browser address bar to invoke the API. Test the following URL in your browser. If you are using Internet Explorer, you will get the following output. Towards the right hand side you can see there are 19 lists being returned. To view the XML output, you can choose the View Source option. Please note that the result is returned in XML format. In programming scenarios, we can use XML or JSON notations to get the results & parse them. In this post we have explored how to start with REST API using a browser. Check your users. If they require Internet access, then Online would be a good choice. Again, going with Online exposes your secured data to the cloud or external-staff access. If your data restricts moving to O365, you can think about On-Premise with public hosting. Online version provides automatic scalability. This will save you enough $$ especially during peak time server accumulation, skill hiring etc. For On-Premises, Scalability has to be achieved based on the following parameters. Usually the Concurrent Users amount to 5-10% of the Number of Users. You can use Visual Studio Load Testing to test again your hardware configuration. Check whether your clients/vendors need access to the site. In that case additional software needs to be installed. Although, Online version provides much flexibility here. If your employees need to access the SharePoint site from their personal device, following options are available. If it is Online, not much configuration is required. If it is On-Premise & Intranet, we can use Micro VPN, Citrix XenMobile etc. For Online version, not much configuration is required. For On-Premise version, Claims based Authentication would be recommended. Zones allows separate web application configuration with different authentication settings. We can configure zones for Internet, Intranet etc. For both the versions (Online & On-Premise) Microsoft does not recommend Server Object Model. App Model / Provider-Hosted Application / SharePoint-Hosted Application are the preferred choice. For C# apps, use CSOM. For JS apps, use REST. For Online version, Microsoft automatically supports Edge servers. For On-Premise version, we need to take care of configuring servers in the farm closer to user’s country/geo-location. Timer Jobs are Old Trend! In this post I would like to inform on a slow trend change in SharePoint Development. Yes! We are moving code from server-side to client-side. As part of this Timer Jobs are not recommended for new SharePoint solutions. Including the past versions of SharePoint, Timer Job provided a scheduled way of executing jobs using server-side code. I too enjoyed it! Timer Jobs were the default way of any SharePoint scheduled job requirement. Why moving from Timer Jobs? As Microsoft is in a mission to remove server-side custom code, Timer Job too got a hit. Since, Timer Jobs reside in the server-side; it is not appreciated as good practice for new SharePoint solutions. Microsoft is in a Mission! As we know, Microsoft is in a Mission to remove server-side code. The introduction of CSOM and availability of almost all server-side API in CSOM accelerates this mission. All the top-clients of Microsoft who use SharePoint, have a clear idea on this part. What to do with new solutions? For new code, do not use Timer Jobs. Train your resources in CSOM and other required aspects. In future, this can help if the solution is migrated to O365 as well. What to do with existing code? For existing code, I would say continue in the same manner. I am not forecasting any deprecation of Timer Job in future. This is just best-practice information. In this post we have explored a major trend change in SharePoint Development of moving away from Server-side code to Client-side code.